Lime is one of the most commonly used minerals in the world. It does however require additional processing to convert it into a readily useable form. The final application usually is that of Ca(OH)², calcium hydroxide (also known as hydrated lime). This is where MERRICK’s experience in the design and manufacture of lime feeding and lime slaking systems comes into play. For economic reasons, on-site conversion of CaO, calcium oxide (also called quicklime or pebble lime) is preferred to purchasing hydrated lime. Quicklime requires only about 75% as much chemical by weight to obtain the same results, which translates to 75% less storage capacity, cost of handling and freight. Additionally, quicklime is less dusty and easier to handle. 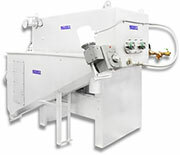 Quicklime is normally metered to the slaker by a gravimetric or volumetric feeder. However, because the weight of a given volume may vary 5 to 15% from the average, gravimetric feeders will compensate for changes in material bulk density and provide a more uniform and accurate flow to the slaker. Consideration should be given to the design of the lime storage bin to insure a constant flow of material to the feeder. Quicklime is discharged directly from the feeder into the inlet of the slaker. The lime feed rate is determined manually or automatically by the level of slurry in the slurry surge tank located directly beneath the slaker or by a demand signal from the process (pH, etc.). The Series 7000 Paste Slaker incorporates a user friendly, highly accurate microprocessor electronic control for consistent water-to-lime ratios. Its innovative design eliminates costly mechanical controls, yet still maintains the heat of reaction to achieve slaking temperatures required to produce smaller hydrate particles. The standing debate regarding the need to sacrifice simple operation and reasonable operating costs to achieve desirable small particle consistency is moot with a simple innovative approach to paste slaking. Simplification is achieved through value added engineering. This approach eliminates expensive, difficult to adjust mechanical components. The OMEGA Series 41 Lime Slaker is a compact, self-contained slaker and feeder package that requires only straightforward on-off control. Only inlet and discharge piping and motor connections are required for installation. The Series 41 Slaker holds a proven performance record for economical use of lime. It’s highly efficient on grades ranging from high calcium, soft burned, highly reactive quicklimes with low oxide impurities content, to slow reacting quicklimes with high percentages of oxide and other impurities. The reason: It’s engineered to provide the right agitation, water-to-lime ratio and temperature for each individual grade.